Put the weave in between the two weavers, and exchange; you kind of twist your grass as you go, and you keep this finger here underneath it like that, for tension…Exchange, twist, exchange, twist…and you’re got the beginning of your little circle here. The best Unangax^ grass baskets are wonders of tight, fine weaving, with hundreds of crossing strands per square inch. To prepare the grass, the weaver picks, bundles, ages, sorts, and dries the blades, then uses her fingernail to split them into thin “weaves” (vertical strands) and “weavers” (horizontal strands). She wets the pieces and twines them tightly together with her fingers, using one of several different weaving patterns. 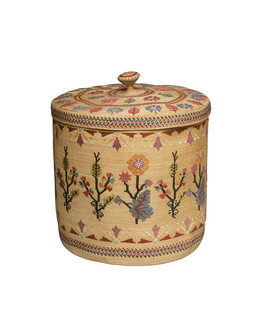 Bright floral patterns have been embroidered in silk thread on this late-19th century cylindrical basket.